SAN ANTONIO, Texas (March 16, 2017) – Cabela’s School of the Year presented by Abu Garcia has seen a shakeup in the Top Five after the completion of the first major Cabela’s Collegiate Bass Fishing Series event for this season. This past weekend, 519 anglers from 84 schools descended onto Kentucky Lake for the 2017 Cabela’s Collegiate Big Bass Bash presented by Berkley. There was no shortage of drama as the event was changed from a 2-day event to a 1-day event ahead of a possible snow and ice storm that was supposed to hit the Kentucky Lake area Saturday night. What everyone didn’t know was that the storm would move in early and play a big factor in the ever-changing conditions with which the college anglers we’re dealing with. Going into the event, Bryan College was sitting at 5th place in the standings, and knew they needed to have a good tournament and take advantage of the double points event. Despite the weather, they brought in several quality bass to the scales led by Nathan Bell with a 6.81lb fish, which placed 7th overall in the event and helped gain vital points towards the Cabela’s School of the Year presented by Abu Garcia race. 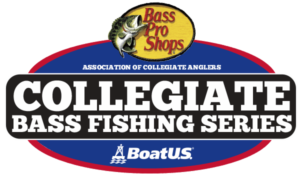 Heading into next week, the race for the Cabela’s School of the Year presented by Abu Garcia title will heat up as the second event of the Cabela’s Collegiate Bass Fishing Series takes place – the Cabela’s Collegiate Bass Fishing Open. Numerous Cabela’s School of the Year sanctioned events will also take place in the next two weeks giving way to another possible shake up in the standings. To see a list of complete School of the Year Rankings, click here: Complete standings. To see more about the Cabela’s School of Year presented by Abu Garcia Program.